In the middle of holiday crafting madness, my fellow CRAFT writers and I decided to take on one more crazy last-minute project: a CRAFT holiday ornament swap with a one week deadline. (I know, we’re insane.) I made these quick felted mitten ornaments for the team, and now you can too!  Make a pattern by drawing a mitten shape on a piece of card stock or cardboard, then cut it out with paper scissors. 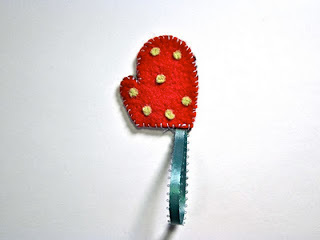 Pin the pattern to a piece of felt and cut out two mitten shapes. One piece is for the front of the ornament and one is for the back—they can be different colors. Using the paper hole punch, cut out as many felt dots as you would like to put on your ornament. 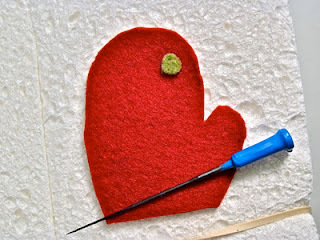 Place the first mitten shape on the foam rubber block or felting mat. Using the felting needle, felt the polka dots to the mitten shape until each dot is completely attached to the mitten. 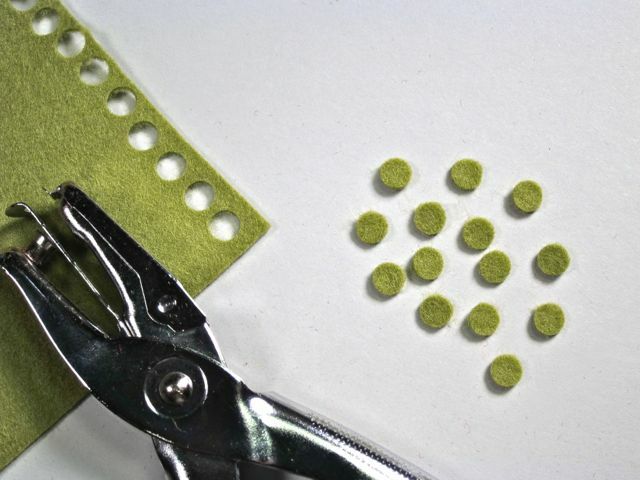 Repeat the process with the second mitten shape, making sure that it’s facing the opposite direction as the front so that the dots will be on the outside when the two sides are sewn together. 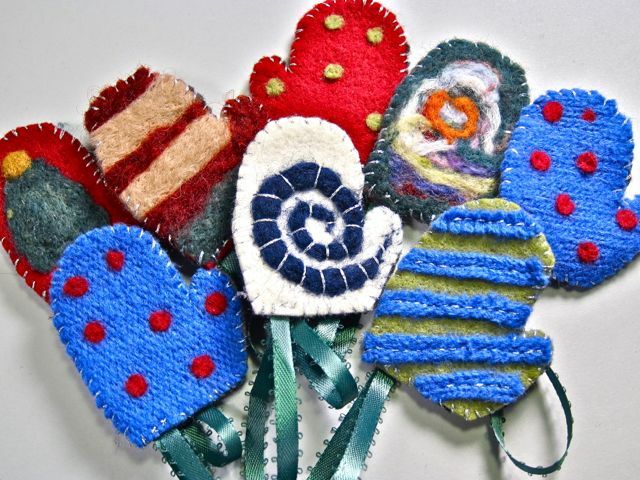 * You can also use felting wool to create your own shapes and patterns. With wrong sides facing, whipstitch the two sides of the ornament together in a counterclockwise direction, starting at the top left corner. Right before you finish stitching around the top, insert a 6″ length of ribbon into the top of the ornament and stitch it in place with two cross stitches. When you reach the beginning, tie off the thread and tuck the knot into the space between the ornaments. Done! 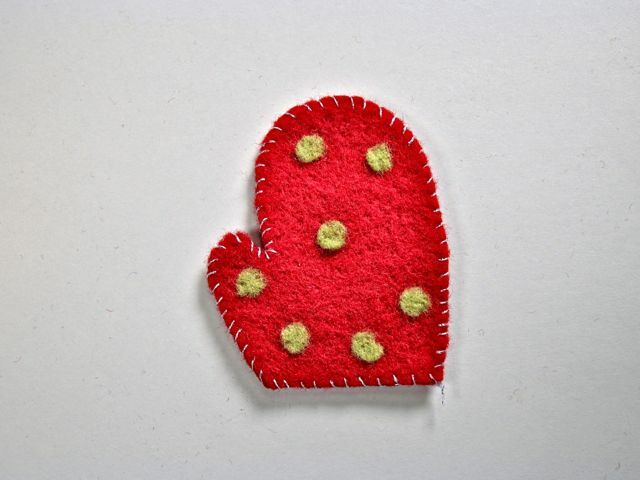 Plus, for the especially crafty, mitten ornaments also make great gift toppers. Happy Holidays, everyone! I hope you have a fantastic rest of the weekend, and get everything on your crafty wish list. Sunday Snapshot: Merry Christmas, Crafty Muffins! These are so cute! I love the neat and tidy stitches around the edges.